In simplest terms, M2V is a MPEG-2 Video Stream file that only contains the video content without any audio, subtitle, and others. So if you want to play your M2V files on portable devices or players converting it to a popular format like MP4 is the best solution. Know in detail about the best solutions for converting M2V to MP4. 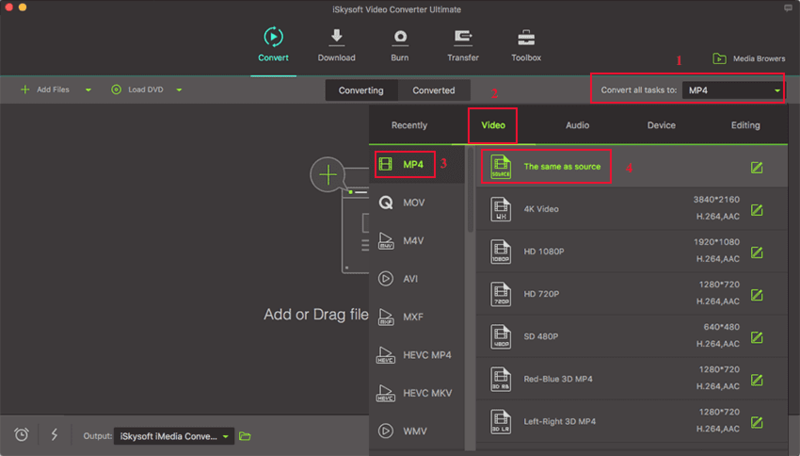 To enjoy high-quality videos, it is important to convert the files without any loss of quality and this could be achieved using professional software like iSkysoft Video Converter Ultimate. This reliable program facilitates M2V to MP4 as well as other file conversions in a simple and quick manner. Over 150 formats are supported by the tool along with an option for device-specific conversion. Allows converting M2V to MP4 in lossless quality, or other over 150 formats including MOV, MKV, WMV, AVI, MPEG, VOB, etc. Works on Windows and Mac system. Launch iSkysoft Video Converter Ultimate software on your system. To add local M2V, click on +Add Files button on the Convert tab of the program. Drag and drop function also works here. You can add multiple files for batch processing. If you need to customize the added M2V files, select the desired editing icons under the thumbnail image of the file. You can select the desired target format from the Convert all files to: option on the top-right corner of the program interface. The Video tab of the pop-up window shows the supported formats. Select MP4 from the list. You can keep the resolution of the output file same as the original file or can choose others from the given options. The final conversion process begins as you press the Convert All button. The converted file gets saved at the PC location selected at Output tab. For users with basic conversion needs, and a few numbers of files, online converters are a good option. With these programs, you do not have to download, install, or register as they work from the browser itself. One such decent program that facilitates M2V to MP4 and other conversions is Convertio. The program supports an array of popular formats and allows adding a maximum of 100Mb files to the program. Files can be added from PC, URL, or cloud storage. The converted file can be downloaded from the program on your PC or can be directly saved to Dropbox or Google Drive. Step 1: On your PC browser, open https://convertio.co/m2v-mp4/. Choose the add M2V files from PC, Google Drive or through a URL. Step 2: Once the file is added to the interface, select MP4 format from the list of supported Video formats. If needed, more files can be added here. Step 3: Click on Convert button to start uploading and converting M2V files to MP4 format. After the process is complete the download link of converted file is made available at the program interface. You can also save the file to Dropbox or Google Drive. M2V: M2V files are MPEG-2 video streaming files that have only the video content. You will rarely find these files alone as there is no option for storing audio, subtitle and other content. M2V files are commonly found during the use of a DVD authoring tool, in combination with WAV or other audio files, chapter points, menus, and other content to create a DVD video. A number of DVD authoring programs may use M2A with M2V files for creating a DVD. MP4: MPEG-4 Part 14 which is commonly known as MP4 is a multimedia container format that mainly stored video and audio content. The format can also be used for storing other data like still images, and subtitles. MP4 is a compressed format with decent quality and is widely used for streaming content over the internet. The format is also known as a universal format, owing to its compatibility with almost all types of portable players, and devices.